A voting-rights veteran talks about the liberal campaign to expand the electoral rolls—and why Obama is on board. When President Obama declared victory last November, you might have missed the way he spun his voter-turnout triumph into a grievance: "I want to thank every American who participated in this election, whether you voted for the very first time or waited in line for a very long time," he said on election night, adding: "By the way, we need to fix that." He returned to the subject at his inauguration: "Our journey is not complete until no citizen is forced to wait for hours to exercise the right to vote." And in his State of the Union address on Tuesday, the president is expected to call on Congress to enact new voting legislation. Several liberal Democrats have already introduced a bill styled the Voter Empowerment Act of 2013. The effort is a cynical partisan undertaking, according to election lawyer Hans von Spakovsky. In December, some "three dozen of the most powerful liberal advocacy groups, including union organizations," held a strategy session, he says, citing a report from the liberal magazine Mother Jones. They agreed to "oppose all voter integrity efforts, things like voter ID," to push for federal legislation requiring states to permit voter registration on Election Day, and to institute "automatic" voter registration. "They basically want to use the government to do Democratic voter outreach and voter registration for them," Mr. von Spakovsky says. "They believe that if they can get, for example, everyone registered to vote who is currently getting government benefits like welfare . . . then that will somehow get them more votes at the polls and make it easier to win elections." The Voter Empowerment Act would also mandate automatic registration of individuals on motor-vehicle, tax and university rolls, many of whom are aliens or have multiple addresses in different states: "You're basically going to be registering lots of people who are ineligible and leading to many duplicate registrations." The groups pushing such efforts--among them the Brennan Center for Justice, the ACLU and the NAACP--include "the same organizations that have been filing lawsuits over the past few years trying to prevent states from verifying the accuracy and eligibility of people on their voter-registration databases," Mr. von Spakovsky says. All this to solve what he argues is a nonexistent problem. "The number of people who don't vote or don't register because they have some kind of problem with registration is a tiny, tiny percentage. It is so easy these days to register to vote, including the fact that many states now allow online registration, that . . . it is not going to increase turnout." Which would be just as well if, as Mr. Obama claims, polling places are too crowded. That problem too, in Mr. von Spakovsky's view, "has been widely exaggerated." A Pew Center study found that in 2008--when, as Mr. von Spakovsky reminds me, "we had the highest turnout in a presidential election since the 1960s"--the average wait time was 10 to 20 minutes. In 2012, according to an MIT study, Florida had the longest average wait time, 45 minutes. Long waits can be a problem in big cities, but officials "can easily fix that themselves, without any federal help, by reducing the precinct sizes." Hans Anatol von Spakovsky, born in Alabama in 1959, is a first-generation American. "My father was Russian," he says, and "my mother grew up in Nazi Germany." They met at a camp for displaced persons after World War II. "My childhood was filled with stories from them of what it's like living in a dictatorship, living with the secret police. I very early understood the importance of our democratic process and how important it is to protect our right to vote." As a young Atlanta lawyer in the late 1980s, he was appointed to the Fulton County Board of Registrations and Elections. "That's where the rubber meets the road," he says in his Southern drawl. "That taught me a lot of lessons about how our elections are run and things that we could do to improve their accuracy and integrity." He tells a story from the field: "The very first thing I ever did was to be a poll watcher in a local election. I walked into a polling place--this was in a housing project in Atlanta--and discovered that the local election officials who were working the desk where people checked in to vote were asking people coming in whether they were a Republican or a Democrat. This was in a general election, where you don't have to answer a question like that. . . . I called it in, I complained about it, and they sent an official down to stop this from happening." In 2000 he served as a recount observer for the Bush campaign in Florida. He later joined the Justice Department's Civil Rights Division as a career lawyer (that is, not a political appointee), where he had "four years of very intense experience" working on the enforcement of voting laws. In January 2006, Mr. Bush gave Mr. von Spakovsky a recess appointment to the Federal Election Commission, where he "learned the other side of the coin, which is our campaign finance rules." When Senate Democrats balked at confirming him for a full term, he withdrew his nomination. In 2008 he joined the Heritage Foundation, where he runs the Civil Justice Reform Initiative. 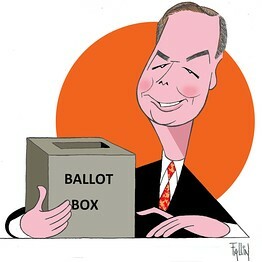 Mr. von Spakovsky is a vigorous critic of Attorney General Eric Holder, whom he accuses of politicizing the Justice Department by enforcing voting laws selectively. The bill of particulars starts with a sensational case: "They threw out and dismissed the voter-intimidation case against the New Black Panther Party in Philadelphia, and that was one of the most obvious cases of intimidation that I have ever seen." On Election Day 2008, two members of the group, wearing paramilitary garb, had stood outside a polling place and shouted racial slurs. One of them was armed with a billy club. The Justice Department dismissed the case, Mr. von Spakovsky says, "because they did not believe, and did not want, the Voting Rights Act used to protect white voters or to prosecute black defendants. We know that's the case because political appointees within the Justice Department said that in front of witnesses, and those witnesses eventually testified under oath." Mr. Holder has also "fought every effort to improve the integrity of our election process." The then-chief of the Justice Department's Voting Section, a career lawyer, had "recommended at least eight states be investigated because it looked like they were not properly cleaning up their voter registration rolls by taking off people who had died or moved or otherwise become ineligible. He was told, again by an Obama political appointee, that they had no interest whatsoever in enforcing that law . . . [or] in doing anything that doesn't increase the registration and turnout of minority voters." In this context, "minority" means "nonwhite," even when whites are a minority. In 2008 voters in Kinston, N.C., a majority-black city of 22,000, approved a ballot measure to establish nonpartisan elections for mayor and City Council. The following year, the Justice Department overrode those citizens by denying the city "preclearance" under Section 5 of the Voting Rights Act. "Their entire concern in the case was not for the actual racial minority there, which is whites, but for the blacks who were the majority," Mr. von Spakovsky says. The Justice Department "objected, saying that it was discriminatory to do this--even though black voters had voted for it--because black voters wouldn't know who to vote for if party labels weren't next to the names on the ballot." In the face of a court challenge, the department reversed itself and granted preclearance in 2012. "The left is constantly working on these voting issues," Mr. von Spakovsky says. "They have dozens of organizations, with a lot of money." The goal, he says, is "to change the rules to give them an advantage in elections. The other side of the political aisle just doesn't do that." The left often accuses the right of seeking to rig voting rules in its favor, often adding the additional poisonous charge of racism. "They keep trying to scare black voters into thinking that these voter ID laws are an attempt to take away the right to vote," Mr. von Spakovsky says. "We know that's not true. The experience of states that have had voter ID laws in place for [several] years, like Georgia and Indiana, shows that it does not suppress the vote of black voters; it doesn't in any way keep them out of the polls." The liberal website TalkingPointsMemo.com reported that in December Chanelle Hardy of the National Urban League boasted that efforts to institute voter ID had (in the reporter's paraphrase) "flipped a switch with the African-American vote . . . rekindling whatever enthusiasm had waned after 2008's historic Obama win." Far from being racist, Mr. von Spakovsky argues, "voter ID is just a basic measure to protect the integrity of the voter-registration process. . . . A lot of times, the victims of voter fraud are in fact black voters and people in poor communities. They are the ones who often are taken advantage of, particularly by some Democrats, because they are less likely to complain or find out that their vote has been stolen." Example: In the 1990s, 11 defendants from 80% black Greene County, Ala., were convicted in a voter-fraud conspiracy whose aim, Mr. von Spakovsky says, was "to prevent reformers from winning elections." The reformers, also black Democrats, were challenging incumbents in primaries. "Those reformers wanted to clean up local government, which was very important to the well-being of African-American residents in this very poor community." The defendants received support from the NAACP Legal Defense Fund. On the other hand, Mr. von Spakovsky acknowledges the partisan motives of Republican lawmakers in Virginia and elsewhere who have recently floated proposals to allocate their states' electoral votes by congressional district. That would enable GOP presidential candidates to carry a portion--in some cases a majority--of the state's electoral vote while losing the statewide popular vote. 'I think it's a horrible idea," Mr. von Spakovsky says. "We have enough problems right now with the way congressional districts are gerrymandered. Particularly, we have a real problem with racial gerrymandering in our congressional districts. Well, if state legislatures were suddenly given the opportunity to influence the outcome of a presidential election dependent on how they drew up congressional districts, that would make the kind of gerrymandering we see now look tame in comparison." Mr. von Spakovsky says it's "disappointing" that voter issues have become a partisan flash point. "It's too bad that some folks try to use this to scare voters and to raise money. It should be a bipartisan effort. The best kind of election is one in which the losing candidate says, 'Well, I lost the election, but it was a fair election.' . . . That's the kind of elections we should be striving for." President Obama, who has won two such elections himself, could do worse than to take heed.